Solar Water Splitting: A Step Towards Carbon-Free Energy and Environment. Credit: Md. Golam Kibria, McGill University. Montreal, Quebec, Canada. New nanotechnology findings from physicists at the University of Maryland have moved us significantly closer to a "holy grail" of clean energy research – the efficient, cost effective generation of clean hydrogen fuel from sunlight. The UMD team created a fundamentally new synthesis strategy for hybrid nanostructures that they and other scientists say make possible new nanostructures and nanotechnologies with huge potential applications ranging from clean energy and quantum computing advances to new sensor development. The team demonstrated the power of their method by creating a photocatalyst that is almost 15 times more efficient in using solar energy to split water (H2O) into hydrogen and oxygen than conventional photocatalysts. Photocatalysts are substances that use light to boost chemical reactions. Chlorophyll is a natural photocatalyst used by plants. "The ingenious nano-assemblies that Professor Ouyang and his collaborators have fabricated, which include the novel feature of a silver-gold particle that super-efficiently harvests light, bring us a giant step nearer to the so-far elusive goal of artificial photosynthesis: using sunlight to transform water and carbon dioxide into fuels and valuable chemicals," says Professor Martin Moskovits of the University of California at Santa Barbara, a recognized expert in this area of research and not affiliated with the paper. Hydrogen fuel cell has long been considered a tremendously promising, clean alternative to gasoline and other carbon based (fossil) fuels that are currently used for cars, electrical generation and most other energy applications. A fuel cell combines stored hydrogen gas with oxygen from the air to produce electricity that can power vehicles, homes and businesses. The only byproduct of hydrogen fuel cells is water. Combustion of gasoline and other carbon-based fuels emit pollutants, including carbon dioxide, the principle greenhouse gas contributing to climate change. It's expected that in 2015, American consumers will finally be able to purchase fuel cell cars from Toyota and other manufacturers. Although these will be zero-emissions vehicles, most of the hydrogen fuel to power them currently is made from natural gas, a fossil fuel that contributes to climate change and increasingly is being produced by the controversial process known as fracking. The cleanest way to produce hydrogen fuel is using solar energy to split water into hydrogen and oxygen. However, decades of research advances have not yielded photocatalytic methods with sufficient energy efficiency to be cost effective for use in large scale water splitting applications. 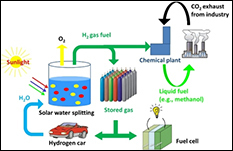 Efficient creation of hydrogen fuel from sunlight is also critical to development of large scale solar energy plants because hydrogen fuel is an ideal way to store for later use, the energy generated by such facilities. The UMD team's work advances the efficiency of photocatalysts and lays the foundation for much larger future advances by more fully realizing a light-generated nanoparticle effect first used by ancient Romans to create glass that changes color based on light. This effect, known as surface plasmon resonance, involves the generation of high energy electrons using light. UMD team leader Min Ouyang, an associate professor in the department of physics and the Maryland NanoCenter., explains that plasmon resonance is the generation of a collective oscillation of low energy electrons by light. The light energy stored in such a "plasmonic oscillator" then can be converted to energetic carriers (i.e., "hot" electrons) for use in photocatalysis and many other applications. In studying this new photocatalyst, Min and his colleagues identified a previously unknown "hot plasmon electron-driven photocatalysis mechanism with an identified electron transfer pathway." The UMD team says their findings hold great promise for future advances to make water splitting cost effective for large-scale use in creating hydrogen fuel. And the team's newly-discovered mechanism for creating hot (high energy) electrons should also be applicable to research involving other photo-excitation processes. The findings of Min and his colleagues were published recently in Nature Communications. Their primary discovery is a fundamentally new synthesis strategy for hybrid nanostructures that uses a connector, or "intermedium," nanoparticle to join multiple different nanoparticles into nanostructures that would be very difficult or perhaps even impossible to make with existing methods. The resultant mix and match modular component approach avoids the limitations in material choice and nanostructure size, shape and symmetry that are inherent in the crystalline growth (epitaxial) synthesis approaches currently used to build nanostructures. "Our approach makes it possible to design and build higher order [more complex and materially varied] nanostructures with a specifically designed symmetry or shape, akin to the body's ability to make different protein oligomers each with a specific function determined by its specific composition and shape," says Ouyang. "Such a synthesis method is the dream of many scientists in our field and we expect researchers now will use our approach to fabricate a full class of new nanoscale hybrid structures," he says. One of the many scientists excited about the new UMD method is the University of Delaware's Matt Doty, an associate professor of materials science and engineering, physics, and electrical and computer engineering and associate director of the UD Nanofabrication Facility. "The work of Weng and coauthors provides a powerful new tool for the 'quantum engineering' of complex nanostructures designed to implement novel electronic and optoelectronic functions. [Their] new approach makes it feasible for researchers to realize much more sophisticated nanostructure p designs than were previously possible." he says. Support for this research was provided by the Office of Naval Research, the U.S. Department of Energy, the National Science Foundation, and the Research Corporation for Science Advancement.